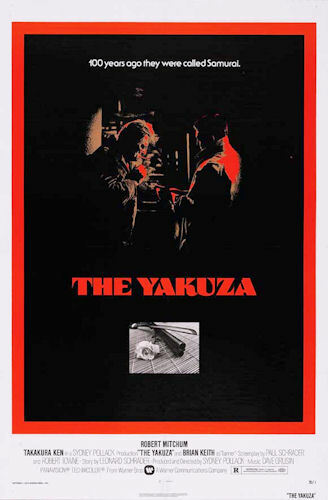 To mark the first anniversary of Japanese acting legend Ken Takakura passing away it is time for Tokyo Fox to look at ‘The Yakuza‘; one of his most memorable Hollywood film appearances which was directed by Sidney Pollack, and written by Paul Schrader of ‘Taxi Driver‘ (1976) fame. In terms of casting, it is Robert Mitchum as Harry Kilmer who is the leading part but it really is Ken Takakura who is the star of the movie. The scriptwriters didn’t put too much effort in to his character name, Ken Tanaka; an honorific version of his yakuza personality. He made quite an impression and went on to become the “go-to-guy” when it came to needing an English speaking Japanese/Asian actor, and he had major parts in later movies like ‘Black Rain‘ (1988) and ‘Mr Baseball‘ (1992). It was even predicted that he would go on to make a real name for himself and star in more American films but the reality of being an Asian in Hollywood was ultimately a hurdle too far. Timewise, it doesn’t take too long for the action to move to Japan but overall it’s a very slow first 25 minutes before Takakura graces the screen in what is a long drawn out first hour or so. He plays a kendo teacher living in Kyoto who is visited by Harry, re-visiting his WWII Japanese roots on a mission to help secure the release of an old friend’s daughter from a Yakuza crime lord. His return subsequently throws him back into the arms of former Japanese lover Eiko which in turn leads him to her brother Ken Tanaka. In terms of the backstory, Tokyo was swept by a firestorm during WWII and more people died in that than both Hiroshima and Nagasaki combined. Eiko’s whole family was wiped out apart from her and her baby daughter. She eventually returned to Tokyo and Harry basically saved her life in some way, fell in love with her, looked after her child and wanted to marry her but she said she could live with him but never marry him. In 1951, Tanaka returned from the jungles of the Philippines having been presumed dead. He thanked Harry for everything but felt aggrieved that she had placed him forever in debt to the enemy and the obligation it put him under to help him. The trio eventually all went separate ways with Harry giving Eiko a coffee shop and bar as a parting gift whilst Tanaka became a notable yakuza. The plot developments in post-war Japan are of course important but it’s perhaps the emotional undercurrents which drive the movie on towards the twist in the latter parts. Takakura is probably not given enough screen time overall but maybe that adds to his mystique. His character is a respected honourable man with a quiet demeanour and stone cold face hiding deep wounds of his past. He lives by and takes great pride in the code and it is this trait which often makes him intolerable to those around him. A mix of emotions are still portrayed throughout a mix of fighting scenes and more tender, emotional moments and Harry eventually comes to understand Tanaka. Both the Japanese and English languages are used effectively in a plausible manner throughout the 112 minutes which you’d think would be easy to do but is sadly so rare in such east-meets-west culture clashes. It’s very much a film from the 70’s and it’s difficult to know which genre it would fit into in todays market. I have only watched it in the last few years and some of the key points seem a bit tired and dated now which I guess can only mean they were original at the time. As is so often the case when international films intertwine different customs and traditions involving Japan, there is a tendency to bang on about honour and losing face and ‘The Yakuza‘ is no different where that is concerned. However, this one also looks at how WWII changed things in Japan as well as other major themes including obligation, sacrifice, loyalty, pride, discipline, friendship, love and loss. Director Pollack says on the DVD commentary that 95% of it was shot in Japan. Tokyo, Kyoto and Osaka all feature but apart from the International Conference Hall on Lake Takaraga-ike (a futuristic building by architect Sachio Otani where the Kyoto protocol was signed) it’s really difficult to work out where the likes of the pachinko parlour, temple, downtown street (Roppongi? ), bathhouse and so on are. Normally I’d laugh at the ridiculousness of a scene where one or two people take on 40 yakuza men but in the climactic battle sequence here, and the fact that their code of honour ensures they must fight sword to sword, means that it is far more believable than usual. This is maybe heightened by the violence not being too graphic or bloody with some of the more wince-inducing scenes happening off camera. Still, we do get to see an arm go flying off so it’s not exactly cartoon violence! This entry was posted in Review: Films Set In Japan and tagged films set in kyoto, ken takakura, list of films set in Japan, paul schrader, Robert Mitchum, sidney pollack, The Yakuza 1974 review, Where is Kilmer House?, yakuza. Bookmark the permalink.